Miami has that mesmerizing proclivity for emanating vibrational sentiments of grandeur whether traveling on business or pleasure. It’s a lifestyle that sets your spirit free as you enjoy the tropic atmosphere, the international music and the diversity of leisure activities to keep the mind in a state of bliss. 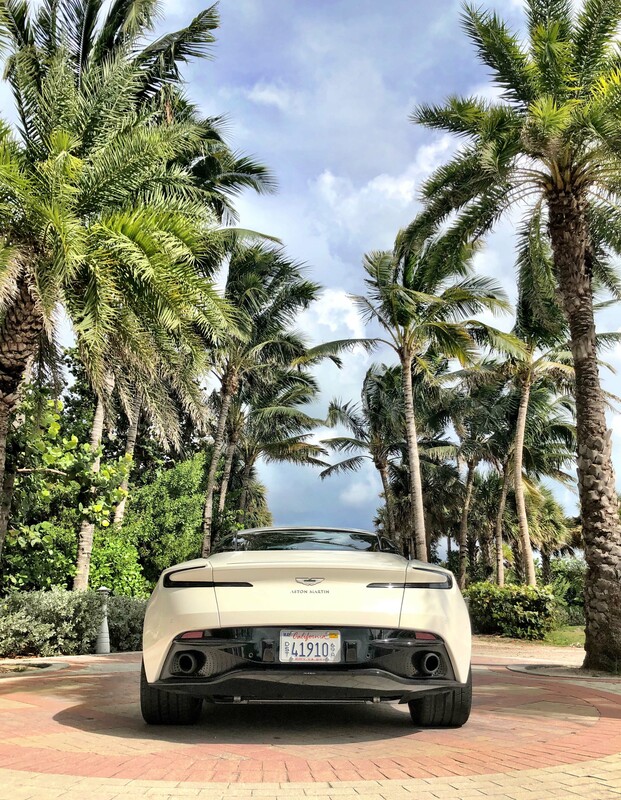 So after nonstop Miami International Auto Show media business was complete it was time for me to find solace in South Beach while riding the waves of perceptual speed and attentional control in the 2019 Stratus White Aston Martin DB11 V8 Coupe. The continuous reactions alone from onlookers strolling along Ocean and Collins showcased how quintessentially distinguished the British grand tourer truly is. Furthermore, 360 enhancement was stimulated by a 2-story suite at The W Hotel South Beach thanks to SPG Ambassador status, amazing 5-star culinary experiences at restaurants like MR CHOW and good friends to celebrate life with. Plus, it was my wife’s Birthday weekend so I flew her down after the work assignment to revel in the moment. 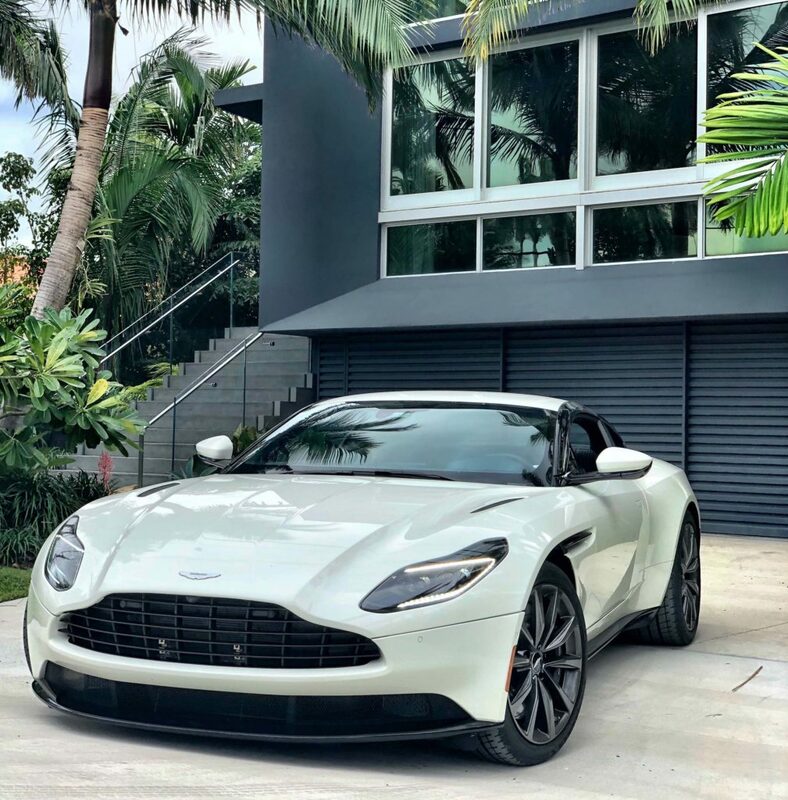 The DB11 is actuated by either a pompous 5.2-liter V12 twin turbocharged powerhouse or the more efficient 4-liter twin turbo V8 disbursing 503-horsepower and 498 lb-ft of torque while paired to a rear-mid mounted 8-speed automatic transmission with steering column mounted paddle shifters. Owners can expect 18 city and 24 highway mpg from the V8 which is the model I was afforded during my 4-day stay in South Florida. 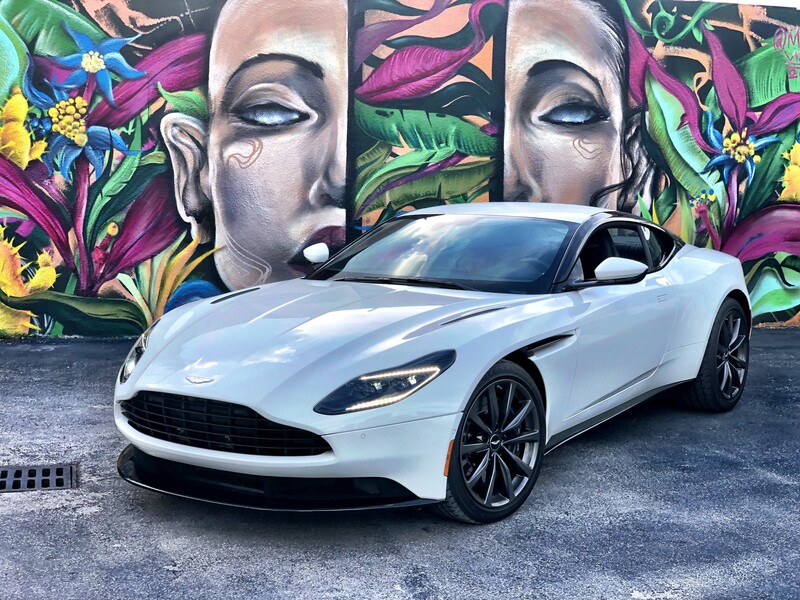 Highly known for their beauty and sophistication, Aston Martins are defined by graceful lines and glorious curves that paint spellbinding silhouettes. 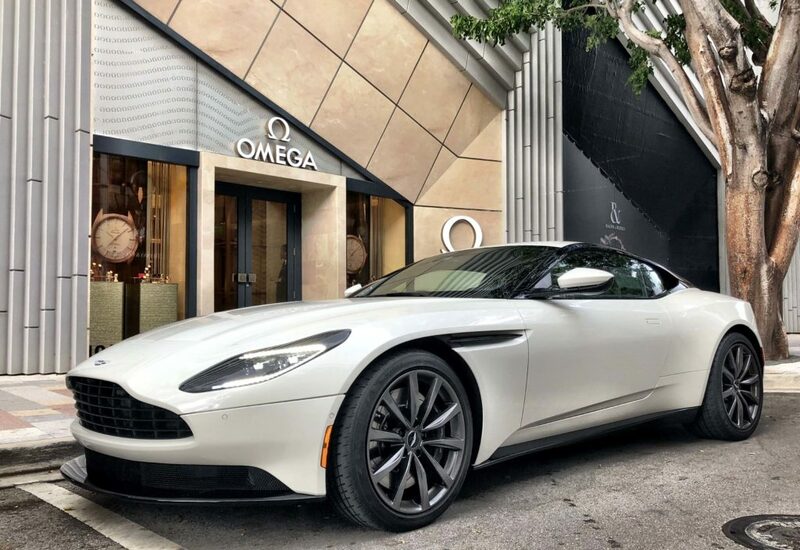 I do believe I spent more time gazing at the sports car in various settings from the artsy Wynwood area for lunch to shopping for a stately timepiece at Omega in the Miami Design District than I did actually driving. Special attention was also generated consistently at the W Hotel’s valet display where you can always expect an elite car show as guests luxuriate in the ubiquitous supercars, high-end SUVs and grand sedans on profile including the DB11 which kept me in PR mode explaining the technologies and amenities behind the $201,495 hand-built coupe. 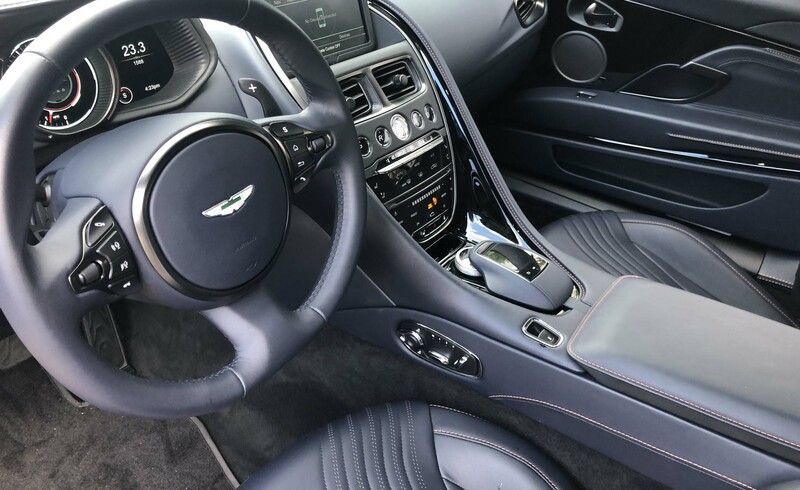 Though, this model reached $235,000 after additional augmentation such as the Dark Exterior Finisher Pack, Black Bodypack, Orange Contrast Stitching, Aston Martin Headrest Embroidery, Dark Chrome Jewelry Pack, Technology Pack and the Piano Black Trim Inlay. Outside of its perfect weather, Miami is dissimilar to say California being that the roads are mostly strait and flat. Thus, in this Floridian setting the ultimate goal is to utilize your ride’s unassailable respectability for cruising rather than ripping runways; unless you make it down to Homestead-Miami Speedway. 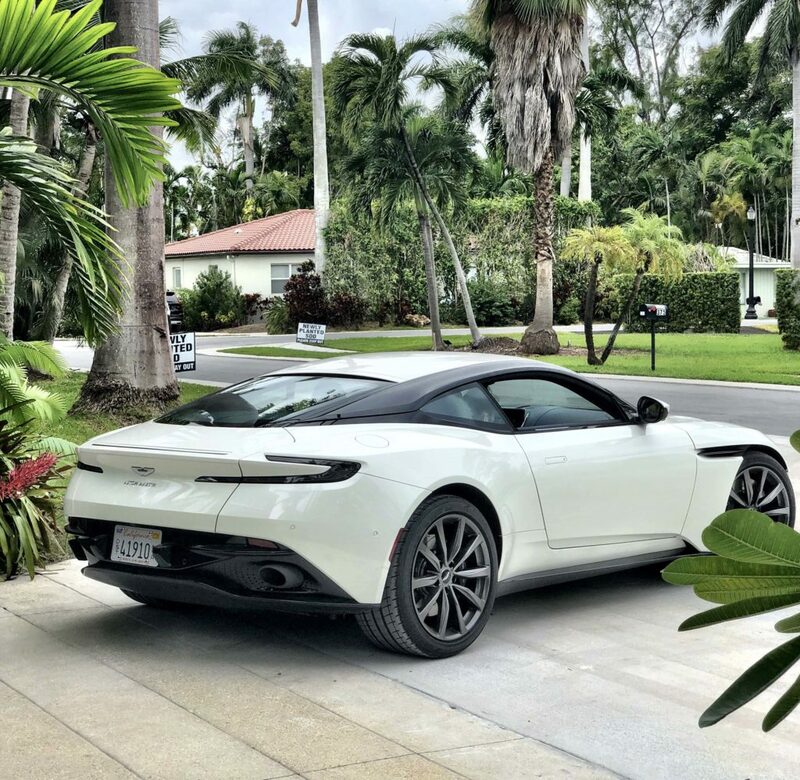 But I did get to play with the DB11’s V8 a bit on the General Douglas MacArthur Causeway in route to the Brickell area and the neighborhoods of the prestigious man-made Hibiscus Island in Biscayne Bay. Selectable drive modes located on the right of the racing steering wheel — GT, Sport and Sport+ — let you control the Aston Martin’s level of performance. In GT mode the DB11’s velocity increase is relaxed and gradual, so in this case I took advantage of Sport for enthusiastic driving while delightfully watching the digital speedometer climb. However, acceleration is not abrupt like muscle cars which is how some supercars react. Cornering agility is impressive and the revered braking system is pinpoint. A Limited Slip Differential and Active Torque Vectoring by way of braking is available for when you do come across Mulholland Drive type roads. 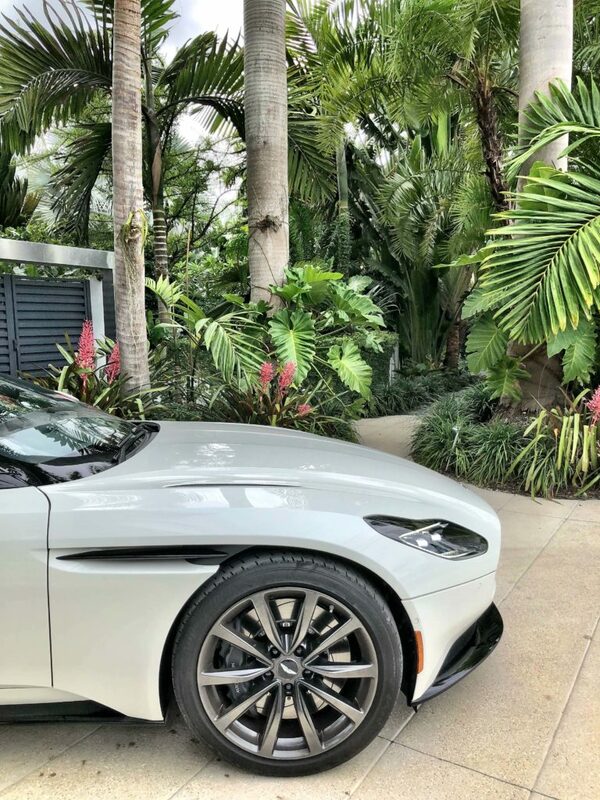 Additional design elements that coincide with the DB11’s performance include the large front splitter, an aggressive rear diffuser, an aluminum hood, staggered Bridgestone Potenza 255/40/ZR20 front and 295/35/ZR20 rear tires and the venerable Aston Martin Aeroblade with a speed deployable spoiler. This minimalist technology generates rear downforce using internal airducts. The Aeroblade replaces the need for a sizeable wing which allowed designers to maintain the DB11’s elegant persona without too much intrusion. Yet, I love stagnant spoilers! Light swan doors that slightly open at an angle and full LED headlamps with cornering lights top off the British presentation of brilliance. Inside the cabin, full Dark Knight Leather (Blue) dominates with the aforementioned cross-stitching for contrast along with knurled light knobs and 12-way heated front seats. Of course the push button starter is aligned with the push button gear controls embedded within the center stack while the 8” screen with a 360 degree camera houses your multimedia functionalities. Reminiscent of Mercedes-Benz’s Comand, the DB11 uses a dial and mouse touchpad for controlling the unit. The interior is devoid of a glovebox so plan to place items in the electric opening center console and cozy door pockets that were perfect for my wallet. At 6” tall the ceiling was a bit low for my wife and I (she first assumed it was a convertible) and the base audio system was just ok. The extended weekend was unforgettable thanks to the power of Aston Martin’s brand awareness, impeccable weather and accommodations fit for a King and Queen and their Golden Chariot. If you can’t make it to the Dominican Republic or Jamaica make sure to earmark South Beach Miami as your next quick getaway. Your spouse will always cherish the memories!